2015 Top Ten Rescue Photo's! It has been a momentous year, both personally and for the volunteer work I do for Louie's Legacy Animal Rescue. I have taken photos of approximately 400 dogs, puppies, cats and kittens this year! It has been a challenge to find the time from my full-time job and from my family. I'm extremely grateful for the other volunteer photographers who stepped in and stepped up when I was getting burned out. They are all extremely talented and so very generous. Picking just 10 out of the hundreds that I've taken has been really difficult! I give you my "Top Ten" favorite rescue photo's of 2015!!! Young Volunteer, Abby, and her foster dog Missy. Missy has been adopted. I love when kids get involved with volunteering, especially with rescues. We have a number of teenage volunteers/fosters that do amazing work for Louie's Legacy. Abby stands out as one of our youngest Volunteers. Her moms refer to her as their very own Dog Whisperer! Abby has an enormous heart when it comes to animals. I can't wait to see what the future holds for Abby! Cats and kittens are really hard to photograph. They do not respond to treats and noises like dogs do, so trying to get them to look at the camera is very challenging. Donut has the most beautiful eyes and I was so thrilled to capture the connection. Midge is a special needs Pomeranian that was found fending for herself in rural Eastern Ohio. Midge's back legs are deformed and twisted like pretzels, but she still manages to move like nobodies business. I thought this costume appropriate for Midge since her determination and will to survive is nothing short of a miracle. And she is so stinkin' cute!! Scruffy is a man with the moves!! 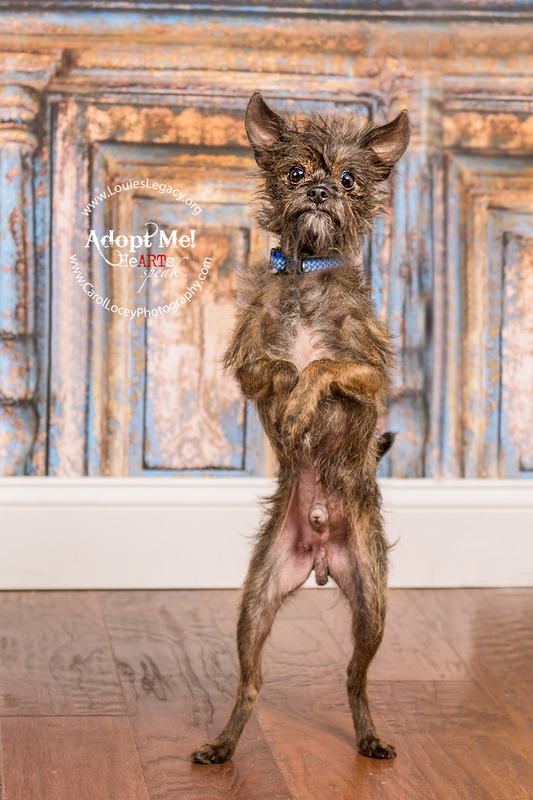 His foster mom got him to stand like this for a treat, but she said he would walk around on his back legs at times! Watch out "So you think you can Dance"!! All kittens have been adopted! As I mentioned earlier, photographing cats and kittens is not easy. Taking 3 at the same time will drive you crazy! I managed it with the help of the foster mom waiving a toy in front of them. Every once in a while a puppy or dog comes along that is so photogenic I just want to swoon. Delilah was one of those puppies. She received dozens and dozens of applications but her forever family ended up driving hours and hours from South Carolina. She is definitely living the good life now! Hardy came to my home studio for his photo session and I wanted to keep him so bad! Just a little bitty guy he was full of charm and character. His foster mom and I had so much fun with different props and chairs; but this one was my favorite. Such a sweet little puppy face. Babette was in foster care for a very long time. None of the other volunteers could figure out why. Babs was sweet and wiggly and incredibly well behaved. She got all "googly eyed" over men (as her foster mom put it). We decided to do a stylized photo shoot with Babs to try and get her more attention. So we had a birthday party for her! I could not get over how well behaved around the cupcake. My dogs would have wrecked everything to get to it!!! I had fun with Babs and I think she had fun too! All Basset puppies have been adopted! What else can I say but 8 incredibly cute Basset mix puppies all piled together! Just look at them!! Tippy with his new parents! Sometimes an adoption happens that was just meant to be. Andy and Amy are the perfect forever family. They took their time in making the decision to adopt, waiting until they were ready for that commitment. They looked at many dogs and met with Tippy numerous times. Finally they filled out an application and Tippy, now T.C. found his happily ever after. This was by far my most favorite rescue photo of 2015! Thank you Andy and Amy for choosing to adopt. There is one more rescue photo that I have to include as an Honorable Mention. This is Cashew, a little Terrier mix that my husband and I fostered. And we made the decision that our family could only be complete if he were included. We adopted Cashew earlier this year. We love him so much and he gets along great with our Lucy and Huck. There is something so special about adopting a rescue. Knowing you provide security, kindness and love to a dog or cat that was once neglected, abused and/or discarded like trash. I highly recommend it! Stay tuned for 2016! It's going to be a great year!